The 13th edition of the “Judicial College Guidelines for the Assessment of General Damages in Personal Injury Cases” was published in 2015. This essential text has now been updated and the new 14th edition has one or two significant changes. In some tragic cases death swiftly follows catastrophic injury. In such cases a victim may be fully aware of their injuries for a short period; may suffer fluctuating degrees of consciousness; undergo intrusive treatment and may fear impending death. Fatal accident claims sometimes include an element for pain, suffering and loss of amenity for the period between injury and death. In some circumstances the awards may be high, for example those relating to asbestos exposure or misdiagnosis of cancer. Others follow extensive periods of disability before death supervenes. In such cases reference should be made to the awards for the underlying injuries or condition, suitably adjusted to reflect the fact (if it be the case) that the claimant knows that death is approaching, and the period of suffering. Yet there are many cases in which a serious injury is followed relatively quickly by death. 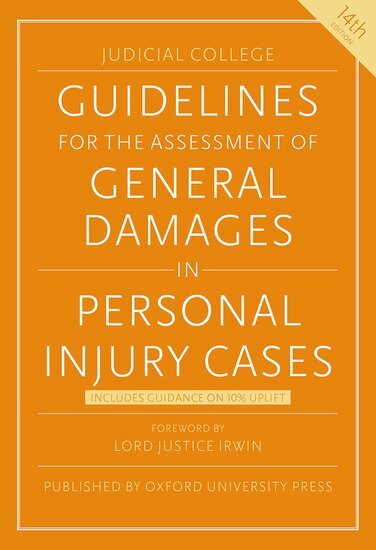 Factors that inform the level of general damages include the nature and extent of the injury, the claimant’s awareness of his impending death, the extent or pain and suffering or, in cases where the claimant is unconscious for all or part of the period, loss of amenity. Under s.1(1)(a) of the Administration of Justice Act 1982 awards may be made for ‘mental anguish’ (even in the absence of psychiatric injury) caused by fear of curtailment of life: see Kadir v Mistry  EWCA Civ 1177. Severe burns and lung damage followed by full awareness for a short period and then fluctuating levels of consciousness for between four and five weeks, coupled with intrusive treatment or significant orthopaedic/physical injuries followed by death within a couple of weeks up to 3 months. Severe burns and lung damage causing excruciating pain but followed by unconsciousness after 3 hours and death two weeks later. Immediate unconsciousness after injury, and death occurring after six weeks. Perhaps unusually, there has bee a reduction in some categories/brackets of these awards. In 2015 category (A) injuries justified awards of between £17,550 and £19,910 while the 14th edition set the brackets at £11,000 to £20,880. Furthermore category (B) awards justified £8,800 – £11,720 in 2015, yet have now reduced to £9,210 – £9,350. Bizarrely and most noteworthy are the changes to category (C) awards, where unconsciousness occurs immediately after injury and death follows after six weeks, there has been an almost 50% reduction from £7,040 in 2015 to between £3,300 and £3,850. Due to ever increasing statements about equality section 9 of the JCG relating to facial injuries, has been amended to remove the distinction between the levels of awards between males and females, with the introduction explaining that such an outdated stereotype was indefensible. In 2015 section 12 related only to dermatitis. The updated JCG now covers other skin conditions such as eczema and psoriasis. 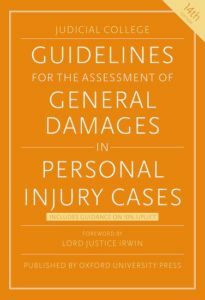 ….with effect from 1 April 2013, the proper level of general damages in all civil claims for (i) pain and suffering, (ii) loss of amenity, (iii) physical inconvenience and discomfort, (iv) social discredit, or (v) mental distress, will be 10% higher than previously, unless the claimant falls within section 44(6) of LASPO.